Hyperborea, in the Hyborian era. Powers: While the Witch-Men are very eerie in appearance and behavior they don't actually seem to have any superhuman powers. They are all quite tall, close to seven feet in height, and are proportionately strong, even though they are fairly gaunt, but their strength is not superhuman. They fall before a sword the same as any other man. They do carry rods which can numb a portion of the body on contact, they are skilled at getting through their opponent's defenses just enough to graze them with their staff, and thus weakening their foes for future attacks. Characteristics: The Witch Men often--at least in their later days--maintain total silence, and they do not even cry out when mortally wounded. They are very pale in complexion and white white hair, which is in contrast to their strange eyes which have no visible sclera (the white part of the eye), and are instead solid green, with small pupils. Their eyes have been described as cat-like in appearance. 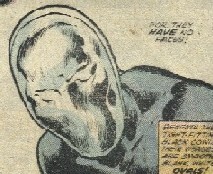 The Witch-Men wear white, featureless masks, which further promotes their seemingly inhuman nature and generates fear in those who encounter them. The Witch-Men have some degree of magical training, and they can perform rituals that extend the power of Vammatar, allowing her to revive and control Legions of the Dead from great distances. (Conan the Barbarian I#258 (fb)) - Over a century before the time of Conan, Vammatar led an army of Hyperborian warriors against an army hired by the Brythunians, which was allied with the sorcerer Kulan Gath. The two sorcerer's power caused the battle to reach a stalemate, and so they called a truce, and joined forces in order to obtain the Iron-Bound Books of Shuma-Gorath. However, when they had reached the Mount of Crom, Vammatar turned on Kulan Gath and ordered her warriors to slay Gath and his Stygian warriors. However, Crom intervened and caused a powerful avalanche that covered and killed the warriors on both sides. (Savage Sword of Conan#39) - After capturing several scouts from a nearby squadron of warriors from Aesgaard, Vammatar had her warriors torture and then kill them, knowing full well that the Aesgaardians had full view of what was occurring. Conan--then in his mid-teens--snuck into the Castle Haloga, slew a Hyperborian, set the castle on fire, and then escaped with the war chief's daughter, Rann Njalsdatter. However, Vammatar then led both a group of Hyperborian warriors and her Legion of the Dead to capture and/or slay many of the Aesgaardians, including Conan. (Conan the Barbarian I#254(fb)) - After imprisoning the rest of her new captives, Vammatar showed Conan the new raiment she had designed for them, in order to strike terror into lesser hearts. Conan and several of the Aesgaardians eventually broke free and escaped Castle Haloga, despite the efforts of Vammatar, the Witch-Men, and the Legions of the Dead. Of these Witch-Men, Kavula was named. ( Conan the Barbarian I#252) - A decade or so later, Vammatar became interested in the revival of Shuma-Gorath. Conan headed north do to dreams about his village being destroyed, and Vammatar sent a Witch-Man and some of her Legions of the Dead to oppose him. In avillage outside of Koth, Conan--alongside his sometime ally, Hobb of Anuphar--succeeded in slaying the Witch-Man, who had been the conduit for Vammatar's power over such a great distance. With that link gone, the Legions of the Dead lost all semblance of life. (Conan the Barbarian I#255,256) - In the ruins of Lanjau, in Corinthia, a group of Witch-Men opposed Conan. They posed as priests and convinced a group of Corinthian soldiers to turn against Conan, or face the effects of the Purple Plague which had claimed many who had come to Lanjau. One of the Witch-Men contacted Vammatar, who revealed that Lanjau had once been the furthest southern outpost of their Hyperborean ancestors. Using a magical sphere to amplify their power and their connection to Vammatar, they revived the long-dead Keepers of the Treasure-Crypt of Lanjau, as well as a number of the plague victims, to server the Witch-Queen. The Witch-Men led the Keepers and other reanimated servants back to the Corinthian city Antilleos where they directed the Keepers to kill everyone they encountered. Conan, having freed himself from the Cornithian soldiers, interrupted the carnage by revealing that he had obtained the Jade Serpent--the protection of the Jade Serpent had been the Keepers' mission in life. Suspecting a trap, the Witch-Men tried to hold back the Keepers, and commanded them to abandon the Jade Serpent and instead follow their new mission as the nucleus to the army that Vammatar was building. Their bond to their lives' mission remained strong and they rebelled, and slaughtered the Witch-Men. The last surviving Witch-Man, Torumjumala, communed with Vammatar, who instructed him to use the magical sphere to try to force their obedience. Instead, Conan hurled the Jade Serpent into Torumjumala's grasp, and the Keepers hacked him to pieces. Conan grabbed the Jade Serpent and took it back to the crypts of Lanjau, where the Keepers returned to their eternal rest. (Conan the Barbarian I#258) - Vammatar sent a pair of Witch-Men, riding atop a horned Nightgaunt, to pursue Kulan Gath and his allies of convenience against her, Conan and Hobb. Conan slew both Witch-Men, but was knocked from Kulan Gath's Bone Dragon, and fell to the snowy ground. (Conan the Barbarian I#259) - At the base of Mount Crom, Vammatar again joined forces with Kulan Gath in order to obtain the Iron Bound Books of Shuma-Gorath. Gath incinerated one of the Witch-Men, to prove his power to Vammatar. Meanwhile, Conan, having joined forces with old Cimmerian allies, as well as a group of Aesir (led by Rann Njalsdatter), attacked the combined legions of the two sorcerers. Conan's group had apparently finished off the last of the Witch-Men and Legion of the Dead, when the battle was interrupted by the emergence of mighty Shuma-Gorath from the base of the mountain. (King Conan#1) - As part of her plot to capture Conan for a league of sorcerers, Louhi led some of the Witch-Men to capture his son, Conn. The young Conn (Age 12), fought back and managed to slay one of them but he eventually fell before the Witch-Men's numbing rods (mind out of the gutter, you perverts!). Back at Louhi's Citadel of Pohiola, a group of Witch-Men sacrificed another captive, so that Louhi could summon Thoth-Amon. After the arrival of Conan and the rest of the wizards, Louhi sent one of the Witch-Men, Kamoinen (or she was just yelling "C'Mon in" with a funny accent! ), with the intention of having him humble Conan. However, Conan instead defeated Kaimonen and hurled him into a pot of flaming coals, knocking them onto Louhi and burning her to death as well. Conan and Conn then joined forces to hold off or slay the remaining Witch-Men and sorcerers until Conan's men could arrive as reinforcement. Prospero's guard slaughtered the remaining Witch-Men. COMMENTS: Created by L. Sprague de Camp and Lin Carter, adapted by Roy Thomas and Sal Buscema. 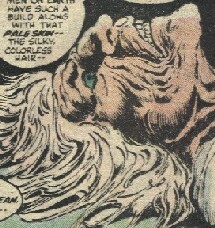 The costumed forms of the Witch-Men was designed by John Buscema. Louhi is described as leader of a sect of sorcerers known as the White Hand, and she is served by the Witch Men of Hyperborea. As far as my readings have gotten me, no other members of the White Hand have been seen, so it is not known if they, too, are served by the Witch Men. In addition, I'm not 100% certain that the Witch-Men are not the White Hand themselves, but they seem to be mere lackeys. Prior to gaining their costumes and staffs, I'm not sure what distinguished the Witch-Men from any other Hyperboreans. 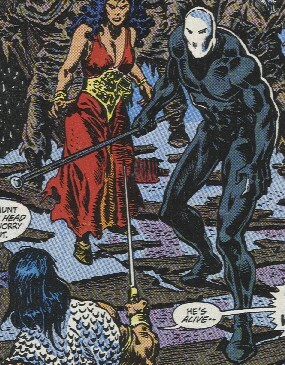 I've listed those who served Vammatar as Witch-Men, and Conan did refer to one as such in Savage Sword of Conan#39. The ones from the flashback in Conan#258 may not have been Witch-Men, as at a later meeting, Kulan Gath referred to them as a more recent innovation. However, he may have just been referring to their costumed forms. ...And I already wrote it, so I'm leaving it in! In Conan the Barbarian I#257, in Numalia, Kulan Gath caused Conan to see the Witch-Men in place of king Nimed's royal guard (and Vammatar in place of king Nimed), causing the barbarian to attack them, and thus to be captured. Hyperborea the Elder, the first kingdom founded by the Hybori, @ 14500 BC. It was eventually overwhelmed by the Aesir, who intermarried with the survivors and created the newer nation also known as Hyperborea (above). The Hybori, a tribe of unknown origin led into the Far North at the time of the Great Cataclysm, @ 16000 BC, by a legendary chief, Bori. Hyboria, a name for a number of countries tracing their ancestry back to the Hybori, including Aquilonia, Argos, the Border Kingdom, Brythunia, Corinthia, Hyperborea, Koth, Nemedia, and Ophir. The entire time period ranging from after the Great Cataclysm (16000 BC) to the time of another major Cataclysm (8000 BC) is referred to as the Hyborian era. Conan lived for an approximately 70 year period @ 10000 BC.